KINGSTON, Jamaica; September 4, 2016: Minister of Tourism Hon. 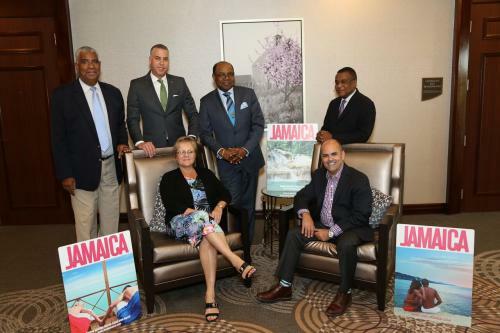 Edmund Bartlett is excited at the prospects of expanding the Canadian market through partnerships with major industry players such as Transat Holidays. During the Minister’s recent trip to Canada, he met with representatives from the travel company and discussed strategies to bolster visitor arrivals from 2017 and beyond. “The meeting with Transat was important because of the known influence they have on the Canadian travel market. This winter, Transat will operate flights from: Toronto, Montreal and Halifax and they are known to add capacity and gateways as demand increases. So, we intend to do our part by expanding the product offering and highlighting Jamaica's value proposition, to increase our arrivals” said Minister Bartlett. While in Canada, Minister Bartlett and high-level representatives from the Ministry’s marketing arm the Jamaica Tourist Board, also met with representatives from entities such as: Air Canada Vacations, Westjet Vacations, Sunwing Vacations, and Travelbrands to address the decline from the market since last year. Information gathered from these meetings will be used to launch a new marketing campaign in Canada in the near future. Transat is one of the largest integrated tourism companies in the world and is the leader in Canada’s holiday travel industry. They offer an extensive selection of destinations and holiday packages on all continents with their key markets including the Caribbean, Mexico and Florida.